Every day and across the nation, our radiologists and support staff work with physicians to provide rapid, expert interpretations of medical imaging examinations, so doctors can determine the best course of treatment for their patients’ health issues. Headquartered in Cincinnati, Ohio, the ProScan Family of Companies is committed to providing healthcare professionals and their patients with exceptional medical imaging services. Our team of highly trained radiologists, technologists, IT and research specialists, educators, and support staff is fully committed to excellence in customer service and the clinical interpretation of MRI, CT, ultrasound, mammography, and X-ray images. Ours is a uniquely broad-based and diverse organization within the medical imaging profession. Not only does ProScan Imaging operate 25 freestanding imaging centers in seven states, ProScan Reading Services provides a wide range of teleradiology services to hundreds of physicians and medical centers across the United States. Our Boston-based affiliate, WorldCare Clinical, partners with the internationally recognized radiologists of Massachusetts General Hospital to provide leading-edge imaging services to clinical research organizations working with major pharmaceutical, biotechnology, and medical device companies. Finally, through the many courses and self-study products offered by the ProScan Imaging Educational Foundation (PIEF), we are also the world’s oldest independent, ACCME-accredited teaching center for advanced medical imaging, with a special emphasis on magnetic resonance imaging (MRI) techniques and applications. To support all this activity, we have developed a proprietary HIPAA-compliant and secure image retrieval and delivery network, fully staffed and monitored around the clock. Because of the incredibly wide range of cases our radiologists read every day, ProScan’s readers have seen more scans of all types than almost any other group of radiologists in the country. That means that no matter what the symptoms, the disease state, or injury, chances are that our readers have experience with many similar cases — experience that will aid them in making the correct interpretation. ProScan Imaging is at the forefront of using new imaging procedures and technology to deliver the best possible diagnostic care to our patients. Through its many ventures, ProScan has gained a reputation as a world leader in MRI, CT, and other advanced medical imaging modalities. ProScan currently has ownership interest in, and provides management and billing services to, 24 freestanding imaging centers throughout the United States. Our 99.7-percent patient satisfaction scores reported by the centers in our joint venture network testify to both our commitment to the skill of our radiologists and staff and our dedication to customer service. ProScan Reading Services is one of the world’s most experienced teleradiology providers. Whether your needs include primary reads, over-reads, vacation coverage, or peer review, we can provide you with exceptional, cost-effective diagnostic solutions tailored to your organization. 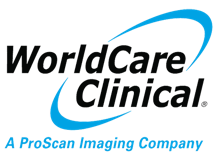 ProScan Imaging also supports a contract research organization, WorldCare Clinical (WCC), a leading imaging contract research organization offering end-to-end imaging services in support of clinical trials for the pharmaceutical, biotechnology, and medical device industries. Cris Collinsworth ProScan Fund (CCPF) is a public non-profit organization that is committed to women’s health and child development. Enhancing women’s lives through knowledge, services, and hope, CCPF’s Pink Ribbon programs promote breast cancer awareness and education through community outreach, special events, and the ProScan Pink Ribbon Women’s Centers in underserved areas of Cincinnati, Ohio.